^ Hurricane Irma: Florida assesses damage as storm weakens. BBC. September 11, 2017 [November 6, 2017]. ^ Christopher W. Landsea; Neal M. Dorst (ed.). A: Basic Definitions. Hurricane Research Division: Frequently Asked Questions. Atlantic Oceanographic and Meteorological Laboratory. June 2, 2011. A3) What is a super-typhoon? 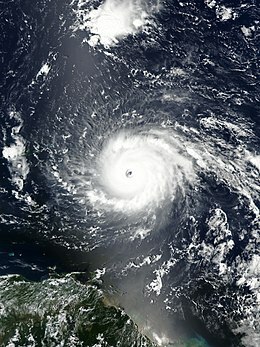 What is a major hurricane ? What is an intense hurricane ? [May 4, 2013]. （原始内容存档于June 15, 2006）. ^ Eric S. Blake. 熱帶風暴艾瑪第一報. Miami, Florida: 美國國家颶風中心. 2017-08-30 [2017-08-30] （英语）. ^ Eric S. Blake. 颶風艾瑪第六報. Miami, Florida: 美國國家颶風中心. 2017-08-31 [2017-08-31] （英语）. ^ Daniel P. Brown. 颶風艾瑪第二十二報. 美國國家颶風中心. 2017-09-04 [2017-09-05] （英语）. ^ Daniel Brown; Chris Landsea. 颶風艾瑪更新. Miami, Florida: 美國國家颶風中心. 2017-09-05 [2017-09-05] （英语）. ^ 颶風艾瑪重創巴布達. 紐約時報. [2017-09-06] （英语）. ^ Bob Henson. 五級颶風艾瑪近如波多黎各. 天氣頻道]]. 2017-09-06 [2017-09-06] （英语）. ^ Landsea, Christopher; Onderlinde, Matthew. 颶風艾瑪登陸. 美國國家颶風中心. [2017-09-10] （英语）. ^ 颶風艾瑪路徑圖. The Weather Channel. [2017-09-13] （英语）. ^ 2017年9月15日18時天氣圖. 美國國家氣象中心. 2017-09-15 [2017-09-15] （英语）. ^ 29.0 29.1 James Oliphant. About 1.5 million, mostly in Florida, without power in Irma's wake. Reuters. 2017-09-15 [2017-09-18]. ^ James Daniell; Bernhard Mühr; Antonios Pomonis; Andreas Schäfer; Susanna Mohr. Hurricane Irma: Report No. 1, Focus on Caribbean up until 8th September 2017 (PDF). Center for Disaster Management and Risk Reduction Technology. [2017-09-09]. （原始内容 (PDF)存档于2017-09-09）. ^ 31.0 31.1 31.2 31.3 31.4 Claire Phipps; Alan Yuhas; Matthew Weaver. Hurricane Irma: Florida braces for epic storm as Caribbean death toll hits 23 – latest updates. The Guardian. [2017-09-08]. ^ Laura Smith-Spark; Marilia Brocchetto. Deaths reported as Hurricane Irma batters northern Caribbean islands. Cable News Network. [2017-09-11]. ^ 33.0 33.1 Madison Park, Emanuella Grinberg, and Ray Sanchez. Hurricane Irma leaves 'nuclear landscape' in Caribbean. Cable News Network. 2017-09-13 [2017-09-18]. ^ (now), Alan Yuhas; Weait, Matthew; Farrer, Martin; (earlier), and Martin Pengelly. Hurricane Irma: 10 dead in Cuba as record flooding hits northern Florida – latest updates. The Guardian. 2017-09-11. ^ The Latest: Irma weakens into a tropical depression. ABC News. Associated Press. [2017-09-12]. （原始内容存档于2017-09-11）. ^ Michelle Kaske and Alexander Lopez. Puerto Rico Faces Hurricane Maria After Irma’s $1 Billion Damage. Bloomberg. 2017-09-19 [2017-09-19]. ^ Angela H. Cutrer. Hurricane Irma leaves St. Kitts and Nevis with initial $53.2 million in damages. St. Kitts & Nevis Observer. 2017-09-15 [2017-09-18]. ^ IRMA, des dégâts évalués à 3,5 milliards. ^ BREAKING: Dutch Prime Minister Mark Rutte says the death toll on St. Maarten has risen to four after Hurricane Irma.. Associated Press. 2017-09-10 –通过Twitter. ^ Extensive flooding, damage in Turks and Caicos. The Nassau Guardian. 2017-09-08. （原始内容存档于2017-09-17）. ^ Hurricane Irma: Death toll rises to 72 in Florida, 112 in Caribbean. First Post. World AFP. [2017-09-27]. ^ Rebecca Harrington. Florida and the Caribbean dig out of Hurricane Irma's devastation and begin a slow and costly recovery. The Guardian. 2017-09-12 [2017-09-13]. ^ 43.0 43.1 Hurricane Irma: Florida assesses damage as storm weakens. BBC News. 2017-09-11 [2017-09-13]. ^ Karma Allen. Hurricanes Harvey, Irma could cost US economy $290 billion, estimate says. ABC News. [2017-09-11].